Some months ago I listed my purchased plugins, now it’s the time for the list of free ones you can download and use with no charge. I used all of them and plan to continue so, they are just awesome and get the job done. First of all, I tried to keep synth pool as small as possible and have all sounds covered. Well, good plugins are pricey. But that’s not the only reason – to many synths can distract you from getting the actual job done. Industry standard substractive. Very simple and easy to program, but with great sound quality. 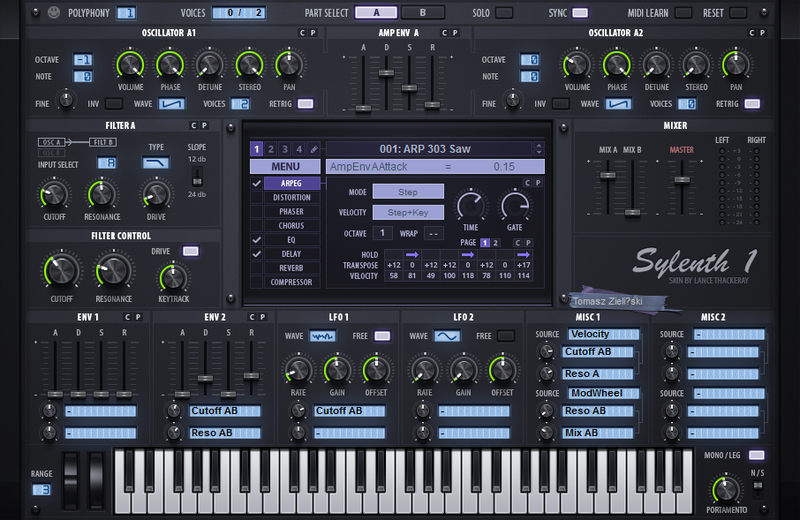 The main advantage of Sylenth1 is the filter section, which can withstand wildest modulation without overdrive or artifacts. Always smooth. Also, CPU usage is minimal. Used for rather simple and clean sounds – kick, psybass, supersaws, acid, random blips. Bigger cousin of Sylenth1. Can do substractive, FM and Wavetable synthesis all at once and has great modulation possibilities. The key feature is unison section which allows you to dial up to 32 voices for any patch. Program whatever you need and just instantly make it big and awesome with multiple voices. Great at leads and pads, but also has cool acid presets. However, tends to glitch at small, fast-modulated sounds. Wavetable monster. 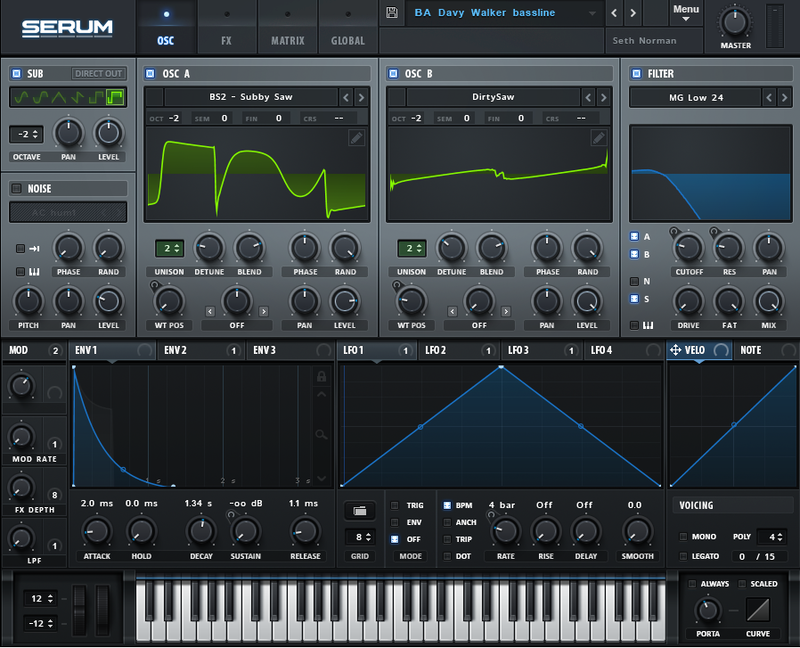 It would be just another substractive synth if not the impressive wavetable engine. Serum allows you to manipulate sounds in variety of ways, including wavetable scan and weird warp modes as well as more standard PWM, FM or phase distortion. Unmatched at basses and evolving arps as well as gritty FX. Great GUI makes it my new favourite. Comes in Ableton Suite. This tiny toy can do substractive, FM and even additive synthesis. Very fast to program wih incredible sonic possibilities. Can produce some bass, but mostly practical in FX / electro / dubstep madness. Unfortunatelly it’s monophonic (or stereophonic at best), but can be easily layered thanks to negilible CPU usage. Granular synth suited for harmonic sounds. Still in beta, but can already deliver beautiful pads as well as monstrous FX and risers. Great drag-and-drop GUI make it easy to program. Another granular toy coming in Ableton Suite. Many custom options result in evolving pads, risers and rolls. ‘Scan’ feature will change any sample into warping monstrosity. For when you need to get dirty. 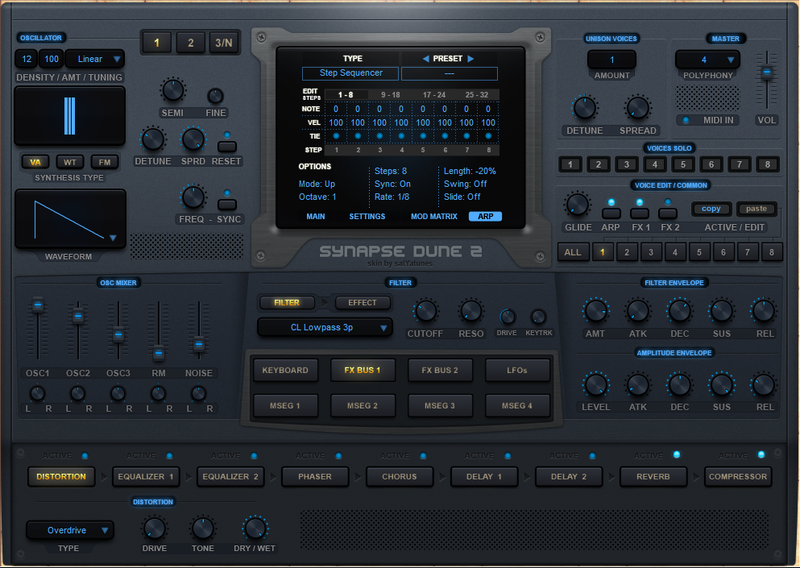 Sylenth1 and Dune 2 have custom skins. It doesn’t seem like such simple plugin would need any upgrade, but it had some issues, for which I apologize. Now all the bugs with mono/stereo channels are gone. 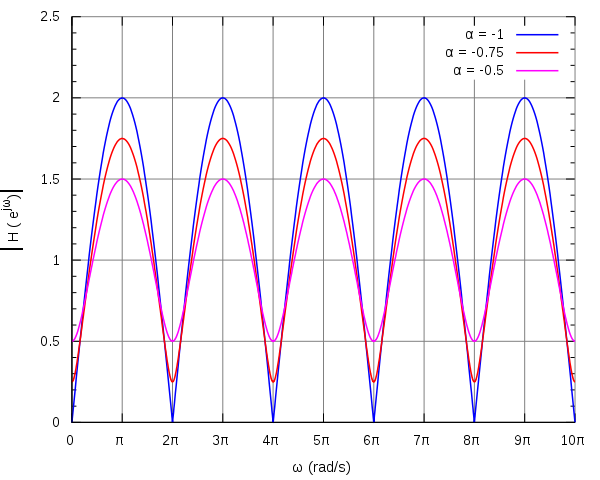 Additionally, Comb Filter will not change it’s frequency with sampling rate. Sampling rates up to 192 KHz are supported in full range, at frequency 1 Hz. However, if you set higher frequency, sampling rate can be rised proportionally – there is no limit that could be reached in practical situation that I know of. Download link is updated. Get it here. I made two tiny plugins in the meantime and want to share them with everybody. Among hundreds of effect racks, mastering suites and filter banks sometimes it’s hard to find exactly what you are looking for. That thing was comb filter, as simple as possible. What it does is to filter out even or odd harmonics and boost the others – perfect for shaping the noise of percussion, in particular. 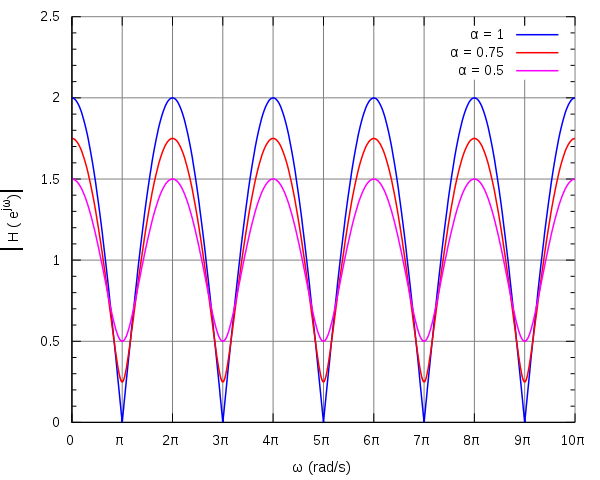 Alpha on the graph is represented by “Mix” knob, while “2pi” is your frequency. Comb filters are also elements of phasers and flangers, so you may want to use them that way. 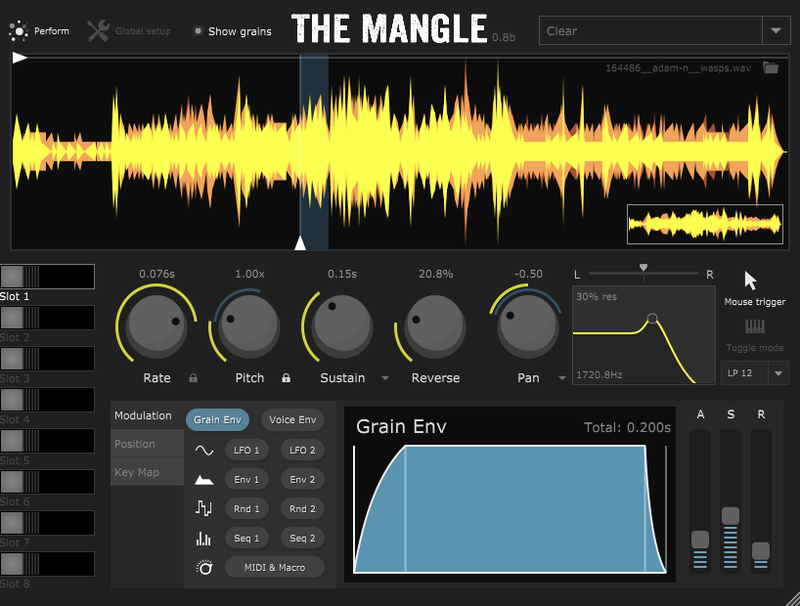 Plugin designed to reduce track volume before mastering without loss of precision. Halving the volume may sound like trivial operation, but there’s more in it. If you try to lower the volume directly from your DAW, multiplying by real number may result in rounding error. Volume halver fixes that, as it multiplies the signal exactly by half, so no rounding is present. This way the only precision you may ever loose is the least sgnificant bit – but that’s inherent disadvantage of any computer system and not the tools you use. It doesn’t even have GUI – just drop one on two on your track before mastering, so it does not clip. 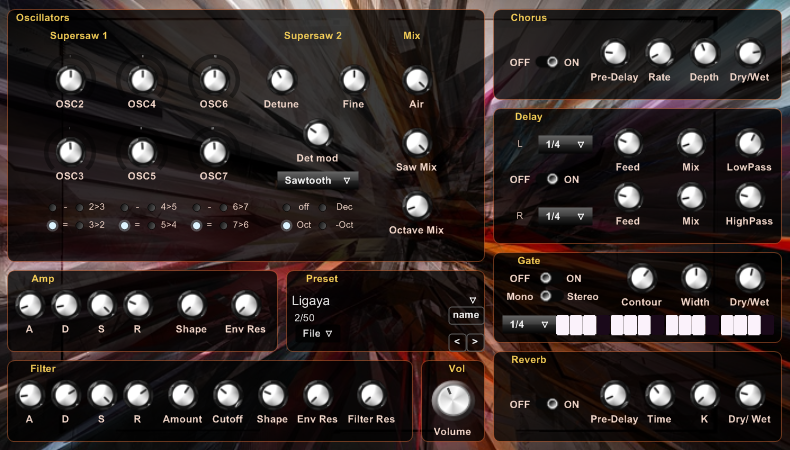 After almost a year, new version of Supersaw synth was released. It now has all necessary and desired features and hopefully is free of bugs or glitches. Doubled number of oscillators. Now the other pair can play octave higher or lower, and, what’s the most interesting, a decade higher. This gives perfect 5:2 frequency ratio, which is what was used in euro-dance and trance ten years ago, but just better. Advanced detune features. It allows to create wide, deep and powerful spectra without artificial sound or noise. Trancegate. For massive, powerful leads in the style of Nu-NRG and what not. No excuses. Volume control. Yeah, that was quite a requested feature. Reworked air reverb. Oh my, what a mess it was. Now it’s simple, clear and easy to understand. Also, it doesn’t use that much of CPU. A number of glitches, saturations, discontinuities and other artifacts were removed. No more clicking. Simplified flow, optimized oscillators. CPU usage was reduced, even though synth has more features now. Get the VST plugin at KVR. To prove that the synth is actually useful, there is a fact – my two latest tracks, Primal and Nice, utilized early version of this synth to produce some really massive leads. Feel the power and energy, enjoy the pristine sound of a supersaw. Ah, and the manual. It is planned soon.